Being a member of Friends of Acadia signals to the world that you care passionately about the issues surrounding protecting and preserving Acadia National Park—its flora, fauna, forests, trails, carriage roads, summits, scenic vistas, seashores and lakes. Membership dollars also help provide a margin of excellence for park programs, personnel and facilities. They fund education, understanding and advocacy aimed at inspiring future generations of thoughtful stewards, help keep the public informed, and Acadia’s threats at bay. The Friends of Acadia Journal is published three times a year. With features about Acadia National Park’s history, resources, and programs, news about Friends of Acadia’s projects and activities, and information about how to get involved, the Friends of Acadia Journal is a great way to stay connected to Acadia National Park, all year long. 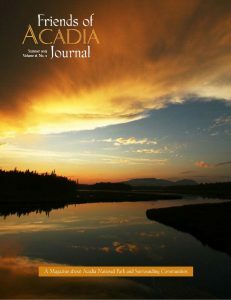 Membership in Friends of Acadia includes a subscription to the Journal. Stay current with Acadia and Friends of Acadia happenings, our monthly Friends of Acadia E-News will be delivered monthly to your inbox. 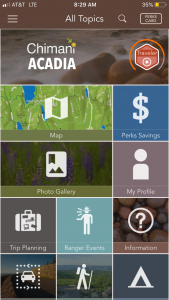 Chimani, the makers of a free mobile app guide to all 418 units of the national park system, has partnered with FOA to offer discounts on its top upgraded service “Chimani Perks.” That gives users unlimited access to 64 super-detailed national park guides, including Acadia, detailed offline maps, and more than $2,500 in discounts from national park-related businesses. New FOA members will receive a special discount code for a FREE, one-year subscription of Chimani Perks — a $29 retail value. Volunteers will also be eligible for a free subscription. For more information, visit our Chimani page. And, importantly, the satisfaction knowing you’re helping to protect Acadia National Park!